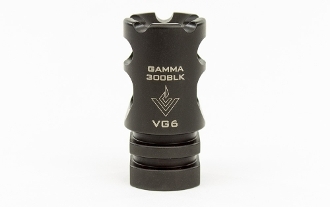 The VG6 Gamma 300BLK is a High Performance Muzzle Brake for Eliminating Recoil. The VG6 GAMMA 300BLK was designed using state of the art engineering techniques, utilizing CFD (Computational Fluid Dynamics) and CAE (Computer Aided Engineering). 100% CNC machined for optimal performance. The VG6 GAMMA 300BLK has been tuned for versatility. While it is perfect for SBR’s, AR pistols, and full sized rifles, the brake has been optimized for 10.5" to 18.5" barrel lengths.